It’s not just the questions you ask that matters. It’s the way you ask them. It’s the order you present them in. It’s deciding which questions to ask which respondents. Checkbox’s comprehensive set of survey questions, along with powerful logic and survey actions, make it easy to structure effective surveys that deliver the data you need. Explore our survey features below or check out our Question Demo Survey. How you ask your survey questions matters a lot, and choosing the right question type is the first step to creating a smart, insightful survey. All of our highly-customizable question types are included with all of our hosted plans or on-premises licenses, because we believe you should be able to create powerful surveys with any budget. Use radio buttons when you’d like respondents to choose a single response from a list of available options. Include an “other” option so respondents can enter their own answer. Use checkboxes when you’d like respondents to make multiple selections from a list of options. You can choose to allow a minimum and/or maximum number of selections, as well as include an “other” and/or “none of the above” options. Dropdown menus allow respondents to choose a single option from an expandable list, and are especially useful for mobile surveys or when you need to display a long list of answer choices. Dropdowns can be shown in “classic” format or as an autocomplete list. Use multi-line free text questions to collect comments or free-form answers. You can style the text entry as plain text or use richer HTML formatting, and even set minimum and maximum character limits. Use single-line text questions to collect short, free-text data like a respondent’s name or email. Use validation settings to ensure that information like email addresses, phone numbers, zip codes, etc. are in the proper format. You can even create your own auto-complete lists to cut down on data entry errors. Create a custom rating or likert scale to allow your respondents to rate an item or experience. You can customize both the number values and text labels of your scale, as well as add an N/A option. Matrix questions allow you to combine questions of similar format into a single grid, which saves space and also makes answering a large number of questions faster and easier for your respondents. Checkbox’s matrix items are fully customizable, allowing you to create as many rows and columns as you need. Columns can be radio buttons, checkboxes, dropdowns, ratings scales, sliders, open text, and continuous sum. Slider questions allow respondents to click a choice or slide a bar to choose a custom image, text or numerical value. Sliders are a great option for image-testing market research surveys. Rank order questions allow respondents to drag and drop text or images into their order of preference. Options can be dragged and dropped in place or into a secondary “bucket”. Rank order questions can also be shown as dropdown or fill in the blank. Star ratings allow your respondents to rate an item or experience visually by filling in a custom number of stars. You can also display the rating in a bar, line or box format. Net Promoter Score (NPS) is a standard market research tool that measures how likely a respondent is to recommend a product or service. Respondents choose a value from 0 to 10, and the NPS report places respondents in different categories based on the score and also calculates an overall NPS for the organization. 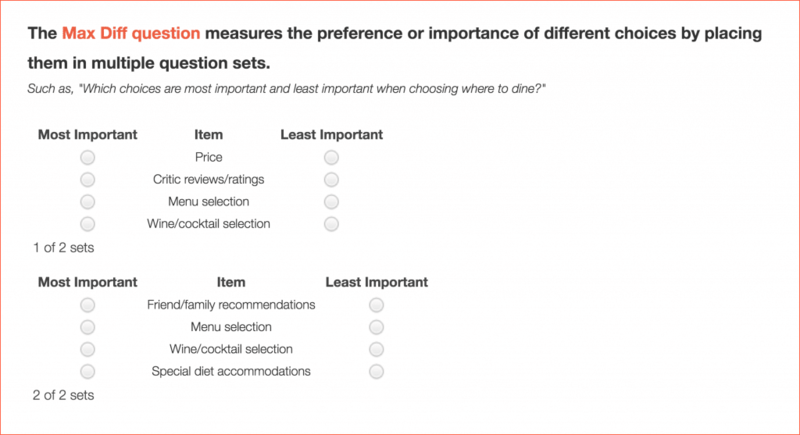 Max Diff is a standard market research question that measures preference/importance scores for multiple items (e.g. preference or importance of various brands, features, images). Answer choices are divided into multiple question sets and respondents are asked to choose their most and least favorite/important option from each set. The Signature item allows respondents to record a digital signature or sign a survey electronically using their mouse on a PC or finger/stylus on a mobile device. Use our custom HTML item to add welcome messages, pages headers, insert images, and even play videos right within your survey. Once your respondent clicks submit, you can easily trigger automatic emails (including the full survey response), redirect respondents to another website or restart the survey for them, display a summary of their survey on-screen, or display a report or poll results. Allow respondents to upload a file as part of their survey response, such as a photo or signed document. Make a file upload required or optional, and specify the file types you’ll accept. Checkbox stores all your files securely, and allows you to download them individually or all at once in a zip file. Use a CAPTCHA item to improve survey security and response integrity, especially on public surveys. You can configure CAPTCHA length requirements, alpha/numeric character entry, and CAPTCHA image sizing. Hidden Items (also called URL variables or query string variables) allow you to “tag” a response with certain information or data by passing it through the URL or link of the survey. For instance, if you wanted to send a survey to a customer after they complete an online purchase, you could pass the customer’s order id in as a Hidden Item. Then, when you export or view that response, you’ll be able to quickly reference the order that the survey relates to. Hidden Items can be populated manually or through code, if you’d prefer to automate this process. Effective surveys ask respondents the right questions at the right time, cutting down on survey fatigue and improving response rates. Conditions are rules that you add to questions, messages, actions, or pages that determine which items a respondent sees in a survey. Checkbox conditions can be based on previous survey answers, user profile information or something about your survey response like the current date or the current survey score. Use conditions to display a follow-up question right after another question, display a question on the next page, or show/hide an entire page. Checkbox can handle all your logic needs from simple, one-rule conditions to complex and/or and nested conditions. Branching (or skip logic) lets you skip respondents over certain survey pages, or even to the end of the survey. Branching is often used when your survey includes pre-qualification questions or when you only want respondents to answer certain sections of your survey. Just like Conditions, Branching rules can be based on previous survey answers, user profile information or something about your survey response like the current date or the current survey score. While you can certainly use Conditions and Branching to display questions and messages, you can make your survey even more powerful by using logic to trigger action items in your survey. For example, you could use your survey to send an automatic email to your customer service manager when a survey respondent gives you a poor satisfaction rating. Or automatically show a custom message or redirect a disqualified survey taker to a new website. Learn even more about our automated survey follow-up capabilities. Merging is another great way to personalize your respondent’s survey experience. User profile information such as name or company can be merged into your email invitation or welcome message to create a personal greeting. Or merge a previous survey answer or the survey score into a question or message item in your survey for a custom survey-taking experience. Scoring can be enabled on any survey, allowing you to assign custom point values to your survey answer choices and calculate total and per-page scores for each survey. For more information on Scoring, please see Results & Reporting. Use radio buttons when you’d like respondents to choose a single response from a list of available options. Include an “other” option to collect the best data possible. We like checkbox questions! Use them when you’d like respondents to make multiple selections from a list of options. You can set up checkbox questions to require either a minimum or maximum number of selections. You can include an “other” response option as well. Use multi-line free text questions to collect comments or free-form answers in respondents’ own words. You can style text entry as either simple plain text, or use richer HTML formatting. Use single-line text questions to collect short free-text data like a respondent’s name or email. Required answer length is configurable. Use validation settings to collect dates, email addresses, and phone numbers (etc.) in usable form. Dropdown menu (or “multiselect”) questions allow respondents to choose from a menu of options. Dropdown menu questions are especially useful in mobile surveys. They allow you to present a lot of options in very little vertical space. Set a rating scale of your choosing and ask respondents to rate an item or experience based on that scale. You can set the scale’s high and low values, and also specify the start, mid and end descriptive text. With matrix questions, you can get at broader issues by combining similar questions with the same response type. Add as many rows and columns as you’d like, within the practical constraints of your survey. Slider questions allow respondents to click a choice or slide a bar to choose an image, text or numerical value. Sliders are a great option for image-testing market research surveys. 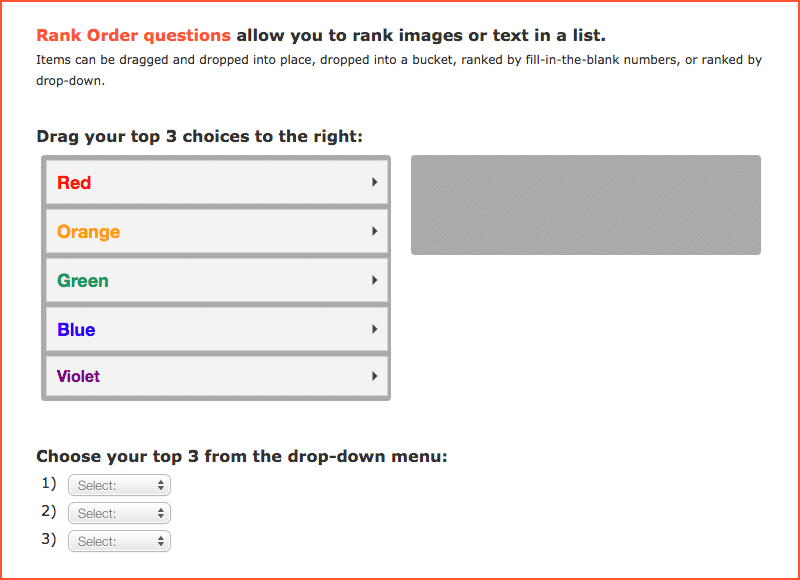 Rank order questions allow respondents to drag and drop text or images into a ranked order. Net Promoter Score (NPS) is a standard market research tool that measures how likely a respondent is to recommend a product or service. Max Diff is a standard market research question that measures preference/importance scores for multiple items (e.g. preference or importance of various brands, features, images). The Star Rating allows respondents to rate an item or experience visually by filling in a custom number of stars. The Signature Item allows respondents to digitally sign their survey or agree to survey terms.